Judy was born to Frank and Margaret Waldeck on June 29, 1953 in Detroit, MI and was raised in Grosse Pointe Woods, MI. 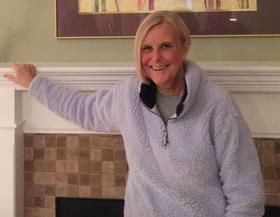 She graduated from Grosse Pointe North High School in 1971 where she met the love of her life, Jerry. They were joined in marriage in 1975, forever being high school sweethearts. Judy and Jerry later moved to Portage, MI in 1982 and ended up falling in love with Southwest Michigan. Work ethic was something Judy took pride in. She was proud to talk about her very first job wrapping gifts at Jacobson’s. Working in Doctors’ offices shortly after getting married, she quickly realized her love of being around people. Having the opportunity to work in the Portage School system, she met her forever best friend, Karen Bailey. A family decision to open a business led Judy from the school system into owning and operating Cookies By Design. Judy was unbelievably creative and was the head decorator at the store. Her creativity not only shown in her business, but also in her personal life where she loved making personalized crafts and gifts for her loved ones. Judy and her husband Jerry built a business based on quality, efficiency and their love of making people smile. They were a known name in the community and years after selling that business, they were both still recognized for their services over the ten years they had the store. After her time spent as a business owner, Judy decided to go into retail and worked at Target, which eventually gave her the opportunity to work at the Target Distribution Center. She devoted her work there for over ten years. Judy had a very special bond with her coworkers at the distribution center . She was known for always making people laugh and bringing humor to any situation. While working there, Judy thought it would be fun to dress up for Halloween. Little did she know, her character “Quita” would become a lifelong staple at the facility. Although she took pride in everything she did, her favorite job of all was being a Mom to her two children. She beamed with excitement when she became a grandmother and was promoted to Mimi. She loved her four grandchildren so much and had a special bond with them. Judy loved going to Ann Arbor to see her two oldest grandchildren, Alex and Jack. Each visit would be jammed packed with lots of playing, walks to the park and visits to the horses in the neighborhood- which she made sure to give names to. Having her two other grandchildren, Lennon and Anderson not far from her in Portage, she spent as much time with them as possible. Special trips to the dollar store and walks to the park were just a couple of her favorite things to do with them. Judy was an animal lover. She had a passion for all pets. Even a spider that would find its way into her home was caught in her bug trap and set free outside. It was not uncommon for her to have a bag of carrots in her car to feed the deer on her way home from work. From a young age, she always had pets. This continued on throughout her adult life. If it was up to her, she would have had a full home of all sorts of furry friends. Judy was known to spoil her animals, but she insisted that it wasn’t spoiling, just extra love. Pets got special treats including her cat Baylee who has developed a love of shredded cheese. But don’t be fooled. Judy would let you know that he only likes finely shredded cheese. Judy loved warm weather. And was not shy to let anyone know how she felt about winter. She hated being cold and it wasn’t uncommon to see her in pants and a sweatshirt when most would be in shorts and a t-shirt. Her love of warm weather drew her to Key West. She and her husband loved to vacation there. Everything about the laid-back lifestyle, weather and culture- Judy was sold. It was where she always dreamed of being when the Michigan winters were just too much. Judy always had a compassionate, loving personality and put others before herself. She had the ability to bring cheer and laughter to any environment she was in with her phenomenal sense of humor and quick wit. She was a devoted wife, mother, grandmother, and beloved friend of many. She embraced all of life’s joys and was an inspiration to everyone she knew and met. To celebrate Judy’s life, drink a hard cider, cheers an amazing women and smile knowing she will always be with us. Judy Gebauer passed away on December 10, 2018 at the age of 65. She is survived by her loving husband: Jerry; children: Joel (Stephine) Gebauer and Devin (Justin) Nelson; grandchildren: Alexandra, Jack, Lennon, and Anderson; brothers: Bill (Jane) Waldeck and Bob (Cheryl) Waldeck; and many nieces and nephews. Judy is preceded in death by her parents: Frank and Margaret (Balke) Waldeck. Please visit Judy’s webpage at www.mccowensecord.com where you can share a photo or memory and sign her guestbook. Memorial donations may be made to the National Marrow Donor Program or the Leukemia and Lymphoma Society.